A basic knowledge of the major types of arthritis will better prepare you for a doctor appointment. You will find it easier to formulate questions and communicate with your doctor once you are confident that you understand basic facts about arthritis symptoms. RA is an inflammatory type of arthritis. The joints are primarily affected, but there can be systemic effects as well. Morning stiffness lasting more than an hour, the involvement of the small bones of the hands and feet, extreme fatigue, rheumatoid nodules, are all characteristics of RA. It is the most common type of arthritis. Degeneration of joint cartilage and the underlying bone, most common from middle age onwards. It causes pain and stiffness, especially in the hip, knee and thumb joints. Bone spurs and bony enlargements are also the characteristics of osteoarthritis. Psoriatic arthritis is a form of arthritis affecting individuals with psoriasis. Joints become inflamed, which causes pain, swelling, and stiffness. Any joint in the body can be affected. Gout is considered one of the most intensely painful types of arthritis. It can cause an attack of sudden burning pain, stiffness, and swelling in a joint, usually a big toe. The knee, ankle, foot, hand, wrist, and elbow may also be affected. 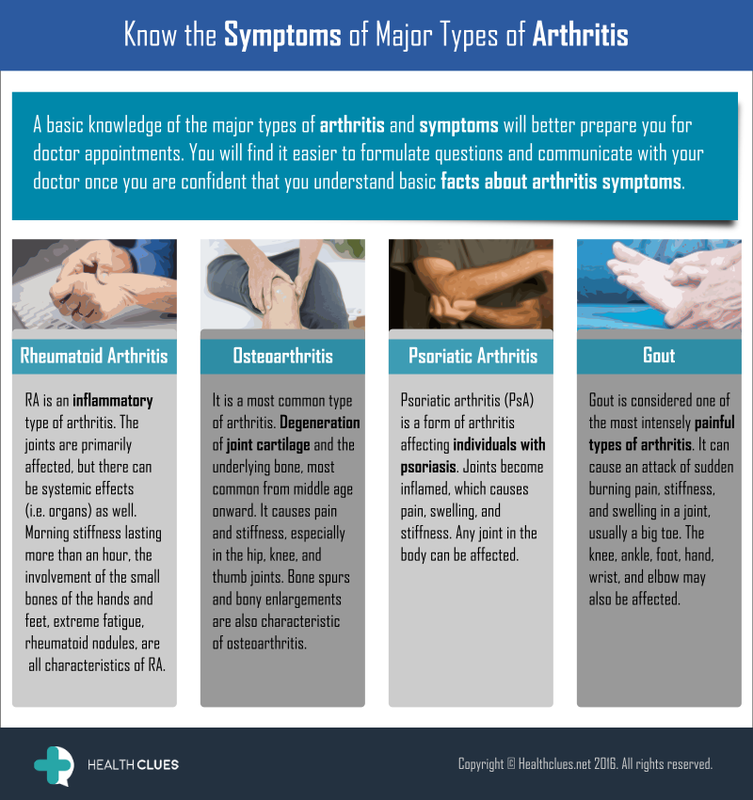 General, Infographics, Osteoarthritis, Rheumatoid Arthritis arthritis, bone spurs, gout, joint pains, knee pain, osteoarthritis, psoriatic arthritis, rheumatoid arthritis. permalink.